The Anarchists get plenty of support from On High in the upcoming Out for Blood expansion for Doomtown Reloaded. They bolster their ranks with more skilled dudes and provide new synergies with existing cards. The Anarchists also gain a new Outfit that further enhances the utility of these cards. 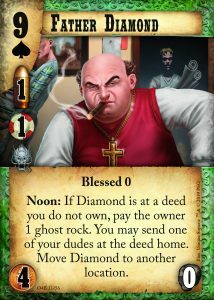 First up is a new Blessed dude, Father Diamond. His reasonable cost without upkeep for influence and the Blessed skill makes him well suited for your starting gang. At the same time, his high value means he can live in your deck without running the risk of failed spell pulls. His ability plays into a couple of Anarchists themes. It requires paying your opponent one ghost rock, thus triggering Property Is Theft’s React ability. As a Noon ability that means it can be used without risking a shootout. The effect itself is a versatile movement ability. Send Diamond out alone to pressure opponents’ deeds, then use his ability to retreat to any other location if threatened. This makes him useful both for players who like early aggression as well as those who prefer a slower game of building up and movement. Use the other part of Diamond’s ability to move a vulnerable booted dude home, or just to keep moving and attempt to draw your opponent out of position as they try to chase your dudes down. Another dude with an ability that works alongside the Property Is Theft Outfit is Reverend Bob Hungate ( if you’ve played through the adventures in Deadlands RPG’s Good Intentions campaign, you might recognise the name). Bob costs a hefty seven ghost rock to bring into play, but has no upkeep costs and gets you a skilled stud dude with two influence. With those stats he’s likely to make an impact on the game when he enters play. Yet sometimes he is worth including in a starting posse. Sending Bob into fights solo and using his ability to keep him alive costs you two ghost rock. This is an expensive strategy, so best save it as a defensive measure when a shootout hand goes bad. Loading Bob up with Miracles such as Holy Roller and Shield of Faith and choosing another of your dudes with lower influence when using his ability is a more cost-effective method of utilising him in an aggressive, attrition-focused approach. In addition to two Blessed dudes that work nicely with Property Is Theft, Out For Blood also features a Miracle that triggers its React during Noon. 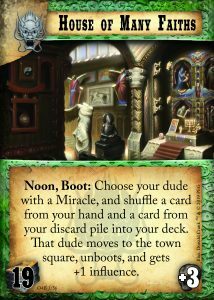 While it has similarities to existing ten-value Miracle Walk the Path, Guiding Light not only lets you move your own dudes around (and potentially unboot them), but it can also move an opposing dude back home. 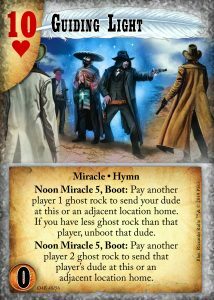 This makes it great for evicting opponents’ booted dudes from locations and could swing a tight game in your favor or remove a key dude ahead of a shootout, assuming you can spare the two ghost rock required to use the ability. 108 Gracious Gifts is another Anarchists home that benefits from these abilities that manipulate the stash of you and your opponent. 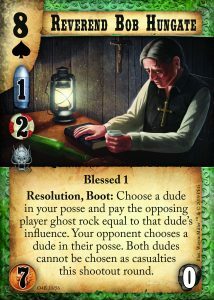 Instead of giving ghost rock to your opponent, we move to a pair of Blessed dudes who can steal it back. 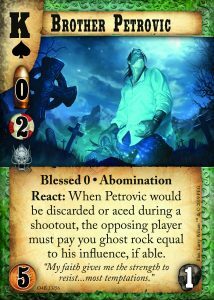 Brother Petrovic, the pacifist vampire, has been spoiled previously and is a great reason to include a Soul Cage or two in your deck. If your opponent cheats in a shootout you can resurrect Petrovic to soak your casualties and net you some of your opponent’s ghost rock in the process. Master Shou is a Blessed who works well alongside Abomination dudes such as Natalya, E Gui and Joe Vermilion to extract ghost rock from your opponent’s stash. He joins Lucretia Fanzini and He Fang on tens, making it a value definitely worth considering for a Blessed Anarchists build. Alongside this influx of Blessed is an Outfit card that directly supports Miracle based decks. The House of Many Faiths is an abandoned mission church, repurposed as a shrine to all religions and creeds passing through Tombstone. Its starting stash of nineteen provides plenty of ghost rock for recruiting your starting gang. As its ability requires a dude with a Miracle, this outfit only makes sense when using Blessed dudes. The ability is great for moving Jokers from your hand and discard pile back into your deck ahead of a shootout. Generally it’s useful for clearing cards you don’t currently have a use for from your hand, and returning key pieces of your strategy that showed up in draw hands back into your deck to give you another chance to draw them without having to wait for a full reshuffle. In addition, it provides a free move to town square and unboot effect alongside an influence buff. The similar Morgan Regulators has proved how powerful such an ability can be. It’s not just the Blessed who benefit from Out For Blood. 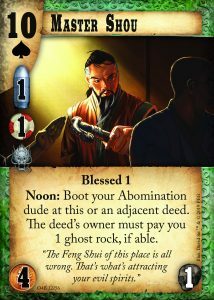 The expansion also includes Ke Wang, a Faminite with a shootout ability that can really mess with your opponent’s best shooter synergizing with Property Is Theft. Finally we have Baijiu Sue. Sue is a solid stud shooter for any deck, but her Kung Fu and her trait make her particularly well suited to bashing heads in a 108 Drunken Masters deck.